Kayaking is well suited to absolutely anyone, no matter what your previous experience. Hire a kayak and paddle up the river to the Priory at Christchurch, go to the nature reserve or just paddle around in the bay by the green. Whatever you do this is a great way to get out onto the water and enjoy this safe and tranquil setting. At ShoreSports we use mostly easy to use Perception sit-on top kayaks, both doubles and singles. 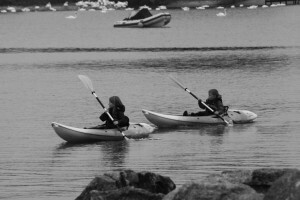 People of all ages can have ago at kayaking.